Have you wondered where all the companies in pharmaceutical and biotech industries are in Canada, and what is happening in the industry? Here you go. Just for you a compendium of industry directories in Canada, the most commonly used job boards for opportunities, professional associations and professional development, and additional resources. Whether you are thinking of career in the industry, have recently graduated from related post-secondary studies or an experienced professional who has moved to Canada; getting the big picture of what types of business are where, how to connect to people and jobs in the industry can help you more effectively plan for and find your place in the pharmaceutical industry in Canada. When planning for work, we need to know where the organizations that we could work in are located. As with every business sector in Canada, there are concentrations of pharmaceutical organizations in specific regions of Canada. Find out where they are to place for where to live. Pharmaceutical and Medicine Manufacturing: searchable directory of pharmaceutical and medicine manufacturing companies across Canada. Canadian Institutes for Health Research: government funded institutions across Canada. 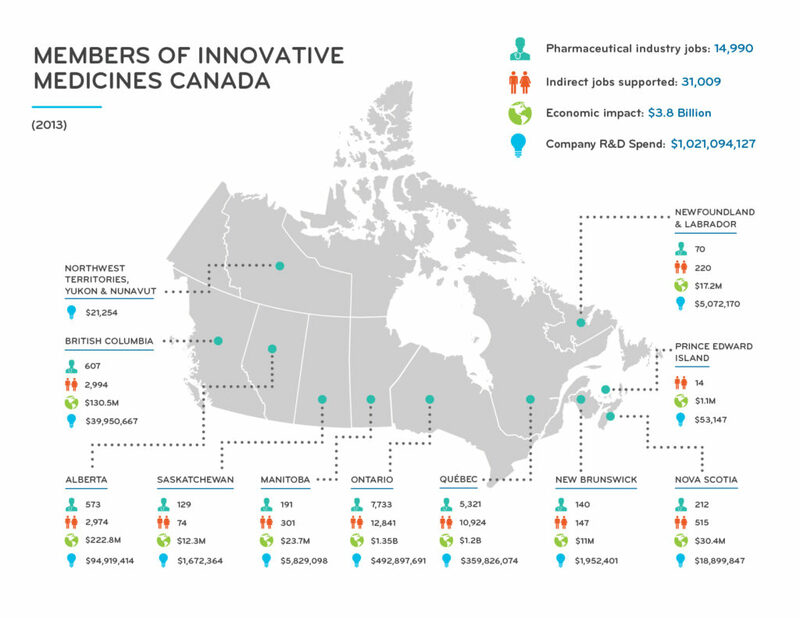 According to Innovative Medicine, Canadian pharmaceutical companies contribute 3.8 billion dollars annually to the Canadian economy, and provide 40,000+ high quality jobs. We can first look with the big picture of this business in Canada, then zoom in to provinces and smaller regions in the country. The Canadian Encyclopedia: Pharmaceuticals in Canada chronicles the history of the industry, and it’s development and issues. Canada’s pharmaceutical industry and prospects, provided by the federal government’s Industry Canada, includes trends from the last 10 years. Refer to the Innovative Medicines Canada (IMC) for the big picture of jobs, economic impact, and research and development of the pharmaceutical industry in Canada. See IMC’s infographics or further details of industry by province. See Greater Toronto area 2017: An evolving industry: Today’s clusters creating tomorrow’s breakthroughs- life science outlook. Quebec City International: Life Science sheds light on the sector in Quebec City. As for jobs in the sector, the following websites have job listing for many companies in the industry, however some companies may only post jobs on their own websites. There a couple of websites specialized in jobs in the sector as listed below, however they have far fewer jobs than the sites listed above. Biotalent Canada: The PetriDish: biotech jobs, most in the province of British Columbia. Opportunities are continuous learning are here for all professionals in the sector. For sales professionals, Council for Continuing Pharmaceutical Education (CCPE) accreditation has been achieved by 95% of Canadian pharmaceutical representatives. This excerpt from Canadian Pharmaceutical Marketing, outlines the accreditation process for pharmaceutical sales representatives. For business intelligence, government affairs, public relations, clinical research, marketing, regulatory affairs, customer service, medical information, medical liaison; and CHE, product, sales and training managers, Council for Continuing Pharmaceutical Education other professions in the industry. Clinical Research Association of Canada certification for clinical researchers. Previous Previous post: No Need to Pay Fees for Banking!